Time for a slight step back. 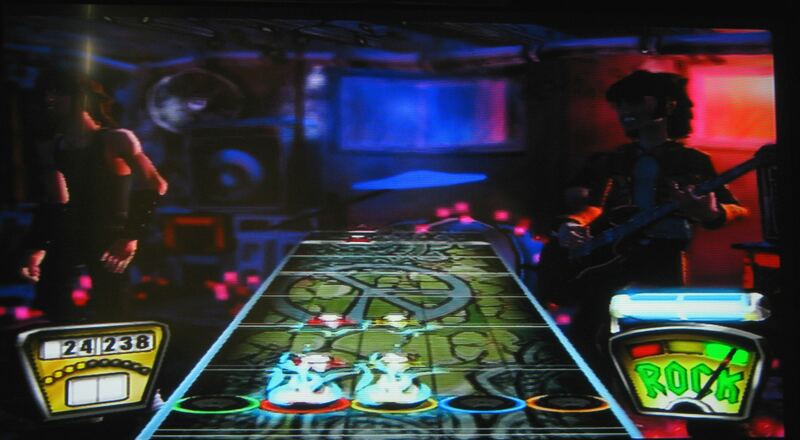 We’ve played Beatles: Rock Band before, as well as played something from the same series through DJ Hero. Now it’s back to the game that (mostly) started this whole plastic instrument craze… Guitar Hero. The first one. Yeah. Before playing, we got the joy of unpacking. We’ve previously played the Xbox 360 editions of these games, as, well, it had better compatibility and such. This time we couldn’t – the first game is only available for the Playstation 2. That means we got to unpack a separate guitar (to be sold on soon), which was its own surprise. It’s tiny! So small! We could barely hold it properly! Let’s see… quite a lot of this game is already familiar, with us having played later games in the Guitar Hero and Rock Band franchises. Simple, good enough – press the buttons, strum, stick to the notes appearing on the screen. The concept is simple, but of course with the speed and increasing number of buttons, it’s not that easy. It’s a basic concept, later implemented using more instruments and with all sorts of other mechanics, but this is the simplest, most straight forward version. No fancy mechanics, just play the songs and follow the rhythm. With that then, the strength comes from the songs. And these games are strong. The game sticks rather well to featuring rock songs, with a number of more famous ones, but also featuring a lot of lesser known, more obscure rock numbers that first of all are quite nice and more important serve as really good songs to play to. Still, it shows that the developers were genuinely interested in the music they were using and went for interesting picks – not as marketing driven, which works well for the game. The graphics are nothing to write home about, but few people would notice anyway. There’s some customization available – for the character you use, the guitar and its skin – but it probably won’t affect you much while playing. You’ll probably want to unlock the songs first anyway – while there is a nice initial selection, you really can do with a larger group, and as this game predates DLC, that’s what you’re stuck with anyway. The game suffers here because of the rights issues. The songs are based on the bands, not their actual performances, and no familiar faces show up. While it would have been too expensive to do so at this point, it at times distracts. Still, that’s just a small blemish on a music game that, by far, sticks to its gun and creates a solid first experience. It got refined and changed later, but that’s not the current game’s fault… it just makes our comparison more difficult. Having recently played Beatmania it is only natural that we notice that whilst being eight years apart there is a lot of similarities with how these games operate. The fundamental gameplay is pretty much the same down to the crowd booing you if your performance isn’t up to scratch (pun unintended). As it has been already said the later Guitar Hero and Rock Band improve a lot on this game but it is always interesting to see a games origins. The dact that the guitar for the PS2 feels so much smaller when compared with later makes is something I never expected.